In a large frying pan heat 2 tablespoons of oil and sauté the onion for 2-3 minutes, then add the sliced peppers and mushrooms. Continue cooking for another 5-6 minutes until tender. 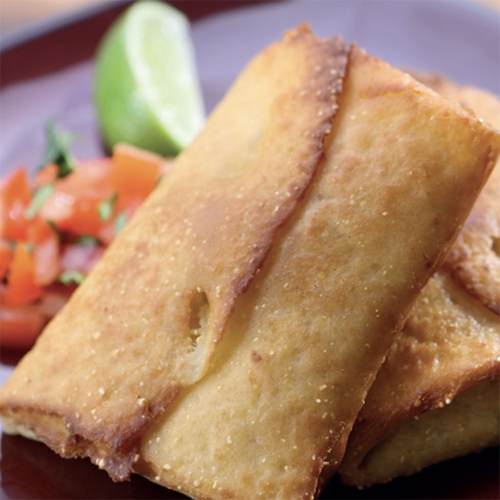 Allow to cool a little and then add the mixed beans, grated Mexicana® and coriander and lime juice. Season with salt and pepper and mix well. Divide the mixture between the tortilla wraps. To wrap them up, fold opposite sides in, turn 90 degrees and fold the remaining sides over to create flat parcels, secure each with a cocktail stick. When you’re ready to serve, either deep fry the chimichangas for 2 minutes until golden or alternatively shallow fry in 1.5-2cm of oil in a large frying pan for 1 minute or so on each side. Either way, remove from the oil with a slotted spoon and drain on kitchen paper. Remove cocktail stick before serving. Why not server them with some shredded lettuce, wedge of lime and a dollop of sour cream.